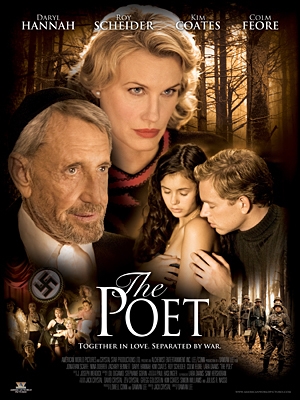 The Poet is a flawed and a much despised movie. Set in Poland in 1939 the central theme is the love story between a German officer and a Jewish girl. I read comments and reviews that would make me feel ashamed if I had been part of this production. Funny enough people either give it a 1 or 2 star rating or 5 stars. Odd, right? Are they really being fair? What infuriates them so much? That Roy Scheider has only a mini-role even though he is on the movie poster? I was not enthused but I did not mind watching it. Sure there is a lack of logic and actors who speak in heavy accents that are not their own is annoying. Still, it is nicely filmed and I found it shows one of the most beautiful depictions of a mother/son relationship. That the mother on top of that is played by the beautiful Daryl Hannah does help as well. These two people are really close. They have a very open relationship. Unlike the one they both have with the father, a German general and Nazi. Unlike her husband mother and son are totally opposed to the German politics of the time. The movie has furthermore some tragic story elements, decent fighting scenes and a female Russian Resistance leader one would not want to mess with. At the opening we see Oscar, the son, on his mission in Poland. He should infiltrate resistance groups. On a trip to the woods he finds an unconscious girl in the snow and rescues her. What Oscar finds out very soon is the core element for the melodrama that will follow namely the fact that Rachel is Jewish. They fall in love at the greatest speed I have ever seen people fall in love in a movie, even though Rachel is already engaged. They are separated early on, as Rachel has to flee. If you want to find out whether they will meet again and if so, under what circumstances, you might have to watch it. Did I mention that Nina Dobrev stars as Rachel? That might actually lead to a more generous viewing of this movie as fans of the Vampire Diaries might want to check out what else the young actress has done before. She is actually quite good in The Poet. Maybe it is all about the poster. People seem to have felt tricked into buying a movie with Daryl Hannah and Roy Scheider as the main protagonists when in truth they have only minor roles. We resent feeling tricked. This entry was posted in Movie, War Movie, Women in War Movies, WWII and tagged Daryl Hannah, Melodrama, Movie Trailer, Movies, Nina Dobrev, Roy Scheider, The Poet, War Movies, Women in War Movies, WWII. One more movie I like a lot is “Inside the 3rd Reich” with Rutger Hauer playing the role of Albert Speer, architect for the 3rd Reich. I guess I was reminded of this because Speer was not anti-Semite but got swept up into the regime. Sounds interesting. I always used to like Rutger Hauer. As for Speer, unfortunately there were some not so bad people caught in all this too. Btw. I got Savior. Have not watched it yet but will do and then post an entry. nina dobrev is a main actress in this movie or not?? And she is very good in it.